5 Join The U-Can! 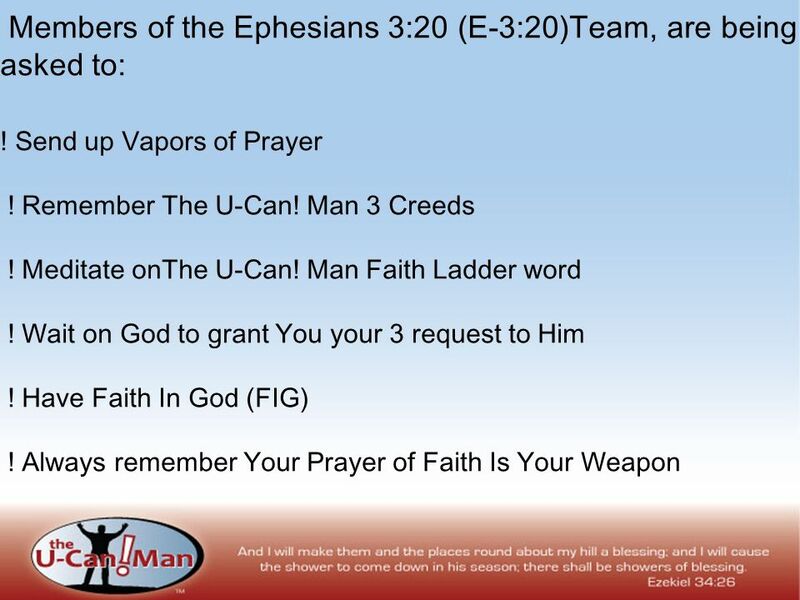 Man E-3:20 Team Whatever situation you find yourself in, take your time and think it through. Then make three request to God in this particular situation. 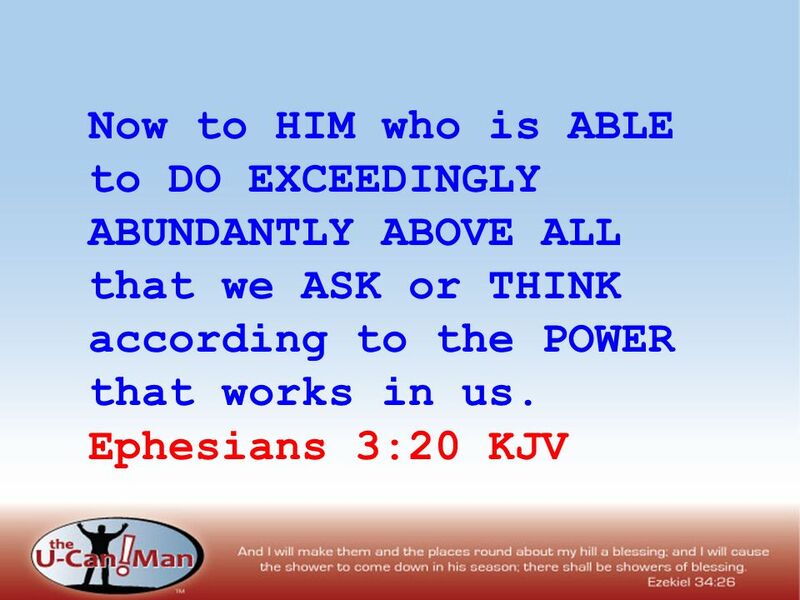 Philippians 4:7 Request to God:1 Request to God:2 Request to God:3 Now to HIM who is ABLE to DO EXCEEDINGLY ABUNDANTLY ABOVE ALL that we ASK or THINK according to the POWER that works in us. Ephesians 3:20 KJV Now that you have made your 3 request known to God, and placed them above above Gods words, Ephesians 3:20. Have faith in God that he is ABLE to Do! 7 The U-Can! 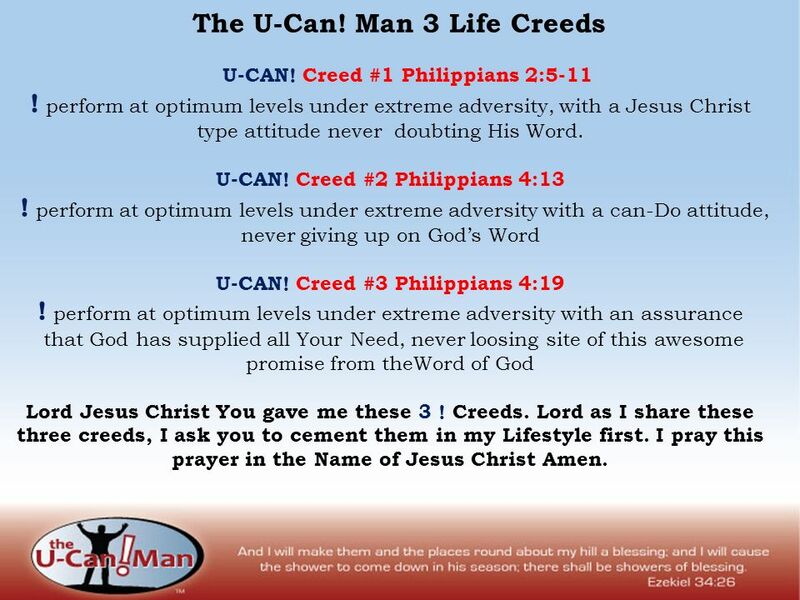 Man 3 Life Creeds U-CAN! Creed #1 Philippians 2:5-11 ! perform at optimum levels under extreme adversity, with a Jesus Christ type attitude never doubting His Word. U-CAN! Creed #2 Philippians 4:13 ! 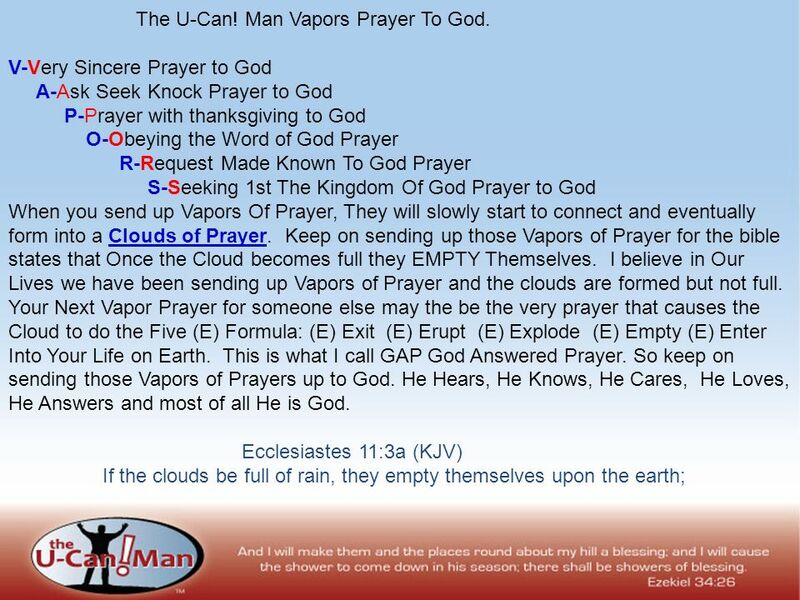 perform at optimum levels under extreme adversity with a can-Do attitude, never giving up on Gods Word U-CAN! Creed #3 Philippians 4:19 ! perform at optimum levels under extreme adversity with an assurance that God has supplied all Your Need, never loosing site of this awesome promise from theWord of God Lord Jesus Christ You gave me these 3 ! Creeds. Lord as I share these three creeds, I ask you to cement them in my Lifestyle first. I pray this prayer in the Name of Jesus Christ Amen. 8 Faith Ladder Down and Back up to Success in 2008 And Beyond 15 January 2008/2356hrs Now it came to pass on a certain day, that he went into a ship with his disciples: and he said unto them, Let us go over unto the other side of the lake. And they launched forth. Let Philippians 2:5-11 Let us Ephesians 3:20 Let us go Mathew 28:19-20 Let us go over Psalm 18:29 Let us go over unto Hebrews 12:1-2 Let us go over unto the Ezekiel 34:26 Let us go over unto the other John 10:16 Let us go over unto the other side 2 nd Corinth 4:7-10 Let us go over unto the other side of Nehemiah 8:10 Let us go over unto the other side of the Deut 28:1-14 Let us go over unto the other side of the lake Rev 20:10-14 Let us go o ver unto the other side of the lakeJohn3:16 Luke 8:22 Now it came to pass on a certain day, that he went into a ship with his disciples: and he said unto them, Let us go over unto the other side of the lake. And they launched forth. 9 The U-Can! Man Motto ! This Moment Believe U-CAN! The End of the Day You see that U-COULD!- Then Tomorrow U-CONTINUE! 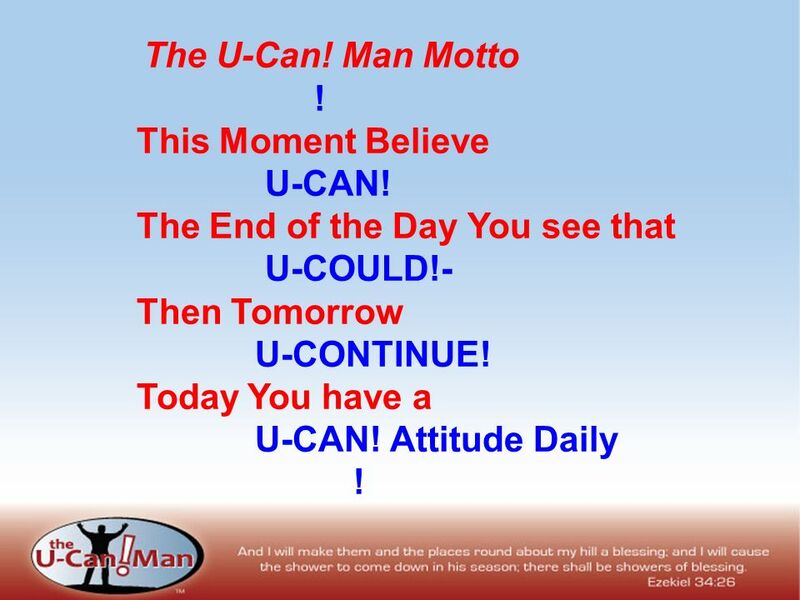 Today You have a U-CAN! Attitude Daily ! 10 As Always Remember U-CAN! Download ppt "U-CAN!. The U-Can! Man Ephesians 3:20 (E-3:20)Team." How to be Strengthened Through Fear, Shame, & Loneliness. The Fellowship of God I John 1:3 0. God is One – A Love Relationship Father Jesus The Son Holy Spirit Isaiah 46:9 Isaiah 43:10 Revelation 7: None. The Source and Object of Mans Love This is My commandment, that you love one another as I have loved you. Greater love has no one than this, than to lay. BIBLE STUDY Diane Avenue Church of Christ August 21st 2011 Entering His Gates.